Golf – but with a warning! Welcome to a golf paradise! However, we doubt that you will manage to improve your handicap here due to a verygood reason: The visual distractions of delightful landscape and fascinating panoramas around the five idyllically located golf courses in the vicinity could severely affect your concentration. Just don’t say we didn’t warn you. 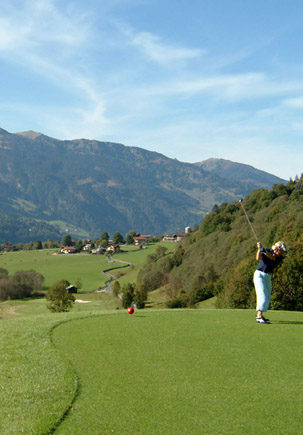 9 holes for golfing pleasure in Gastein and the nearest 18 hole course is just 20 km away! And as a Golf Partner hotel we organise a 10 % discount on green fees for all guests. Naturally we offer a free shuttle service to the Golf Club (5 minutes) Rooms with view of the golf course. Golf rooms – if you just can’t get enough of the greens! one of Austria’s oldest and most traditional golf courses. The 9-hole course is not very difficult, but does have a few surprises. The fairways and some sloping sections make the game interesting.